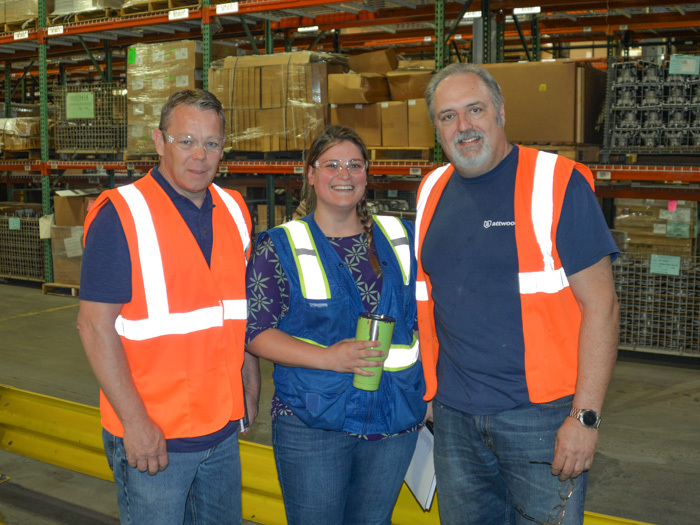 IR Dan Luhmann, left, tours the Attwood facility with Human Resources Manager Jamie Orr and L-M7 President Mark Babcock. John Zoulek assembles a MotorGuide trolling motor. 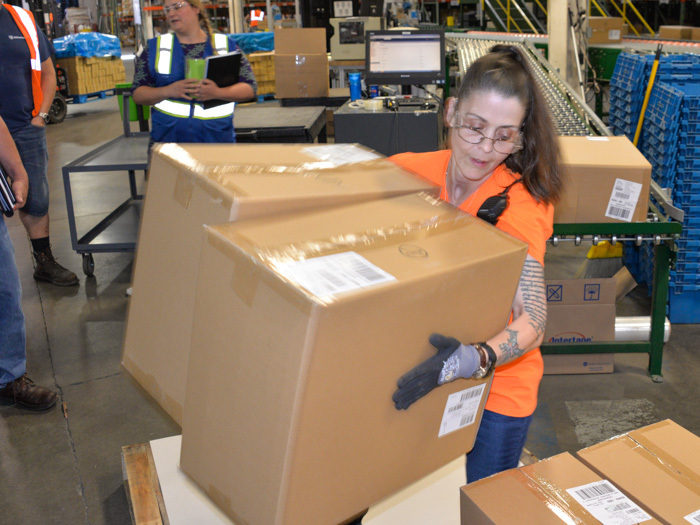 Patti “Spitfire” Godre moves products in the distribution department. Roger Walling assembles and finishes a boat seat pedestal. Laurie Markham wires a navigation light. Jeffrey Dukes works on a hot water heater used in yachts and other vessels. 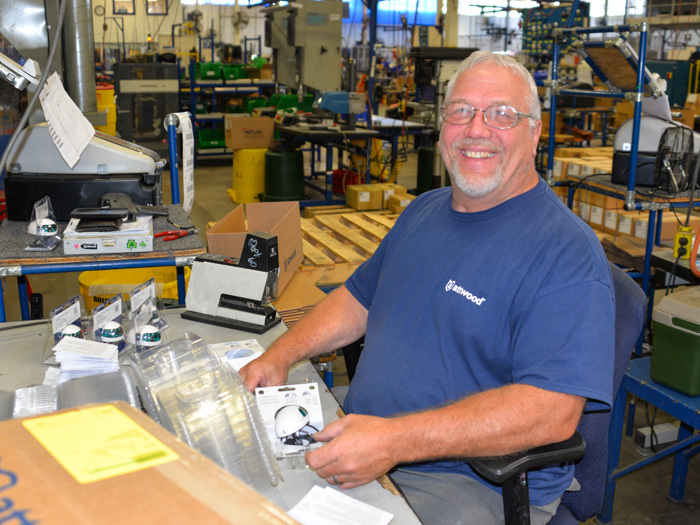 Lance Walkington places boat lights in clamshell packaging for shipment to retailers. Jake Phenix replaces a sanding belt used for finishing stainless steel pedestal bases in the CNC and weld shop. 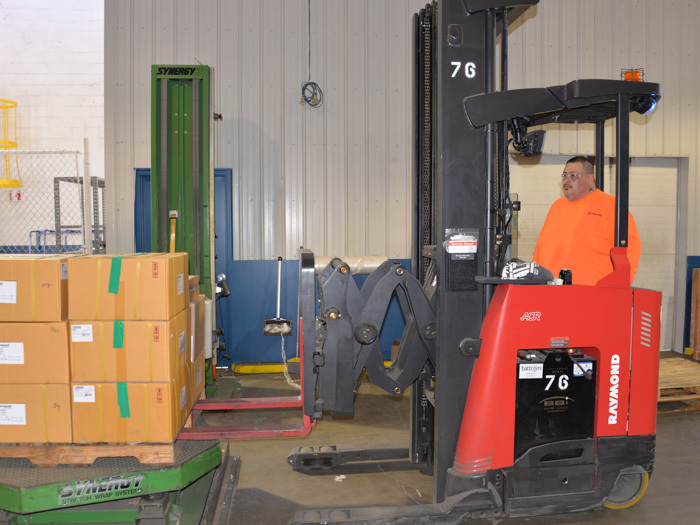 L-M7 steward Jamie Rivera moves boxed product onto a shrink wrap machine. 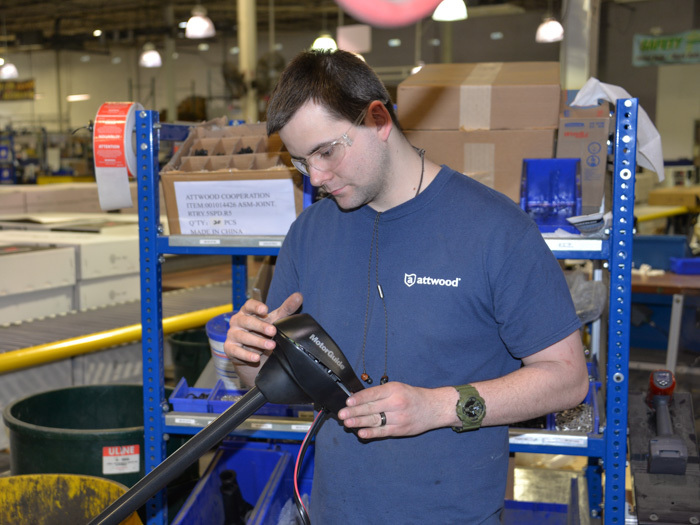 Workers at the sprawling 450,000-square-foot warehouse and plant in Lowell (near Grand Rapids) assemble navigation lights, seat pedestals, MotorGuide trolling motors and myriad other products and accessories. 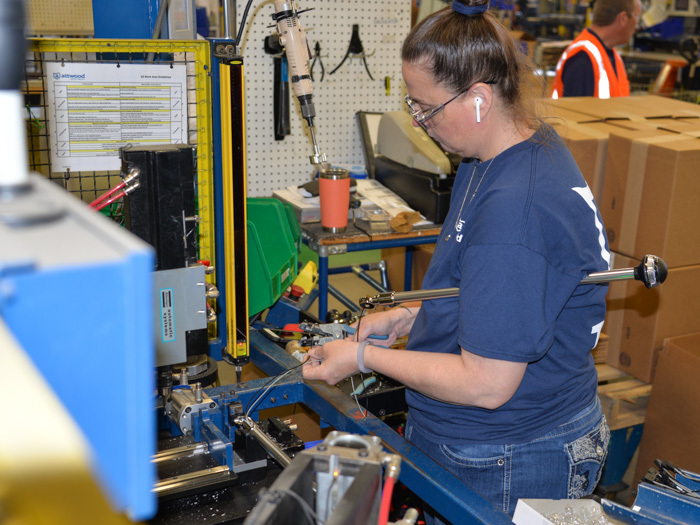 They also stock, customize and distribute thousands of parts to outdoor retailers across North America, from brick and mortar stores like Cabela’s and Bass Pro Shops to online shopping sites. Some products are also used in automotive and RV markets. M7 President Mark Babcock, a 35-year employee, calls Attwood “the Amazon of boating accessories and parts.” Indeed, if it supports a fishing seat, makes it easier to lift a deck hatch or heats the water on a yacht, you’ll likely find it on the floor-to-ceiling shelves at Attwood. 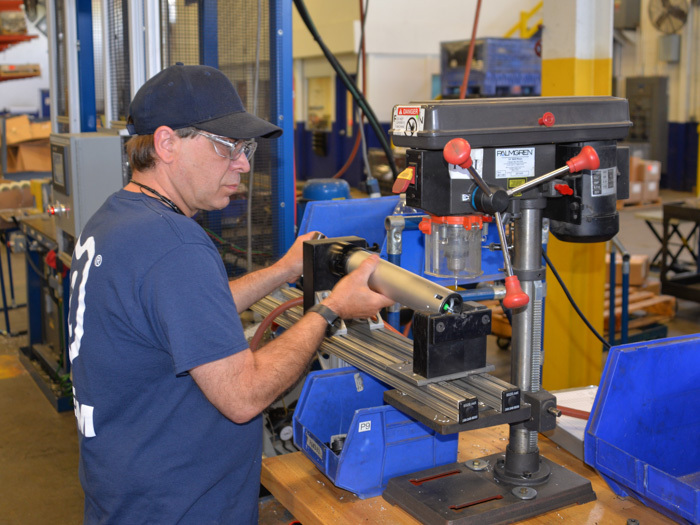 Babcock runs the Spring Department, where gas-assisted rods or “springs” used in boat and RV hatches are calibrated for various manufacturers. 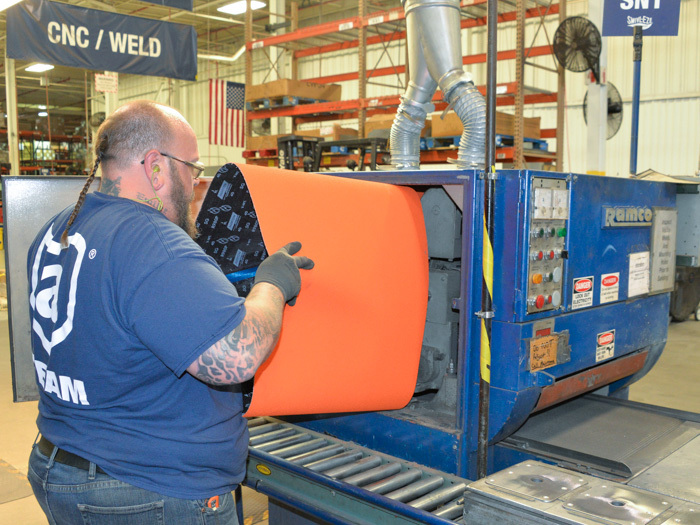 Throughout the vast plant, Boilermakers assemble, modify, inventory and distribute tens of thousands of parts every day. Local M7 received its Boilermakers union charter in 1996.